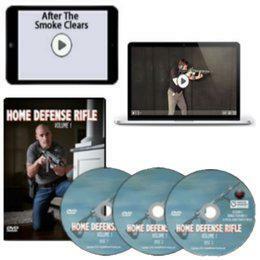 Get the DVDs AND instant online access to the course created by a combat tested US Navy SEAL and full time firearms instruction team. 10+ hours of training and demonstration ranging from the basics of the AR-15 to home defense tactics to high speed, real life drills. The ONLY firearms training available that seamlessly integrates and hardwires situational awareness, deterrence skills, fighting to your gun, reprogramming your startle response, transitioning to muzzle punching, and more. Home Defense Rifle Training Guide: 113 page PDF version of the Home Defense Training Guide. After The Smoke Clears: Your legal fight starts the second after you have had to use your firearm to legally defend yourself or a loved one...this will help keep you from making legal mistakes that could cost you for the rest of your life.